The longest Interstate Highway, Interstate 90 serves major northern cities such as Seattle, Chicago, Cleveland, Buffalo and Boston. 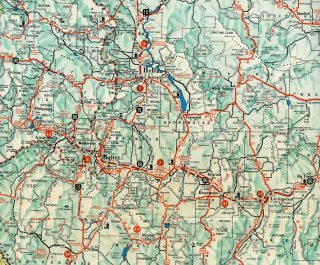 Regional served cities from the Pacific Northwest to the Rocky Mountains and Great Plains include include Spokane, Billings, Sheridan, Rapid City and Sioux Falls. The freeway traverses several mountain passes along the northern tier and can be closed during extreme storms during the winter months. I-94 combines with I-90 east across southern Wisconsin. The two merge at a rural exchange outside the city of Tomah and lead 63 miles east to Wisconsin Dells and I-39 south of Portage. I-39 joins the two routes south 29 miles to the capital city of Madison, where Interstate 94 branches east toward Milwaukee. Interstates 39/90 remain paired southward to Janesville and Rockford, Illinois. East from Rockford, Illinois to Boston, Massachusetts the majority of Interstate 90 follows toll roads. Some sections of these toll roads predated the 1956 Interstate Highway Act. Tolled sections of I-90 in Illinois include the Jane Addams (Northwest) Tollway; between Beloit, Wisconsin and O’Hare International Airport and the Chicago Skyway, between I-94 and the Indiana State Line. Interstate 90 combines with I-80 across northern Indiana along the Indiana East/West Tollway. This toll road connects the Chicago area with Hammond, Gary and South Bend. Entering Ohio west of Toledo, Interstates 80/90 continue east along the Ohio Turnpike to Elyria. They separate there with I-80 staying on the toll road south of Cleveland and I-90 winding northeast through Sheffield and Avon toward Downtown Cleveland. I-90 straddles the south shore of Lake Erie from Cleveland to Ashtabula and Erie, Pennsylvania. Crossing into New York, I-90 transitions onto the Erie Section of the New York Thruway system. The toll road extends northeast to Buffalo, where I-90 becomes a toll free route through the urban area. East from I-290 and Buffalo, Interstate 90 follows the New York Thruway mainline by Rochester and to Syracuse, Utica and Schenectady. I-90 loops east from the Thruway mainline through Albany, reconnecting with the toll road on the Berkshire Section linking I-87 with the Massachusetts State line. The remainder of I-90 lines the tolled Massachusetts Turnpike (Mass Pike) spanning the width of the Bay State. The Mass Pike connects Springfield, Worcester and Boston. 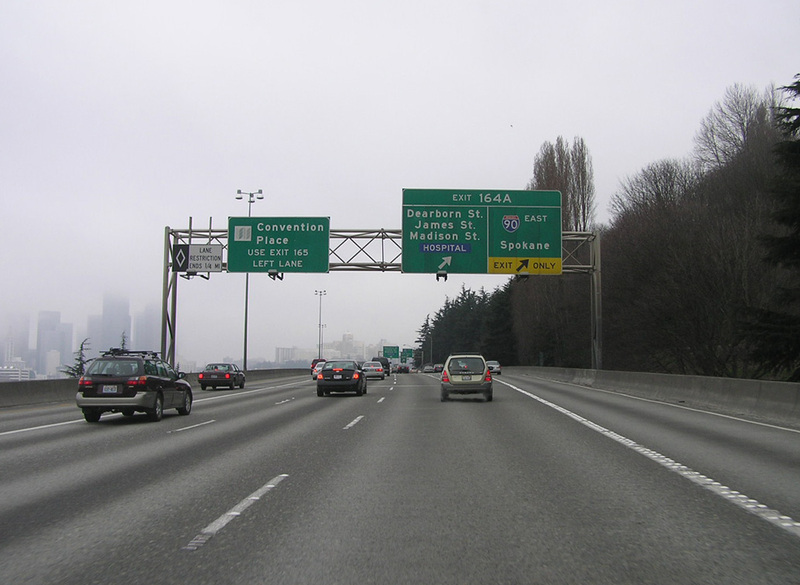 Interstate 90 in the Seattle metropolitan area is part of High Priority Corridor 35: FAST Corridor. 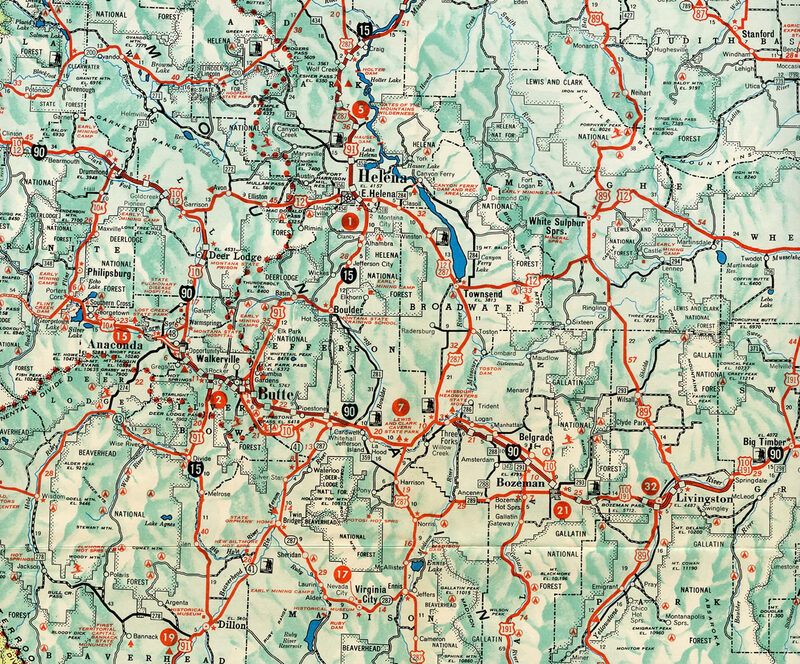 From Seattle east to Billings, Interstate 90 replaced U.S. 10. 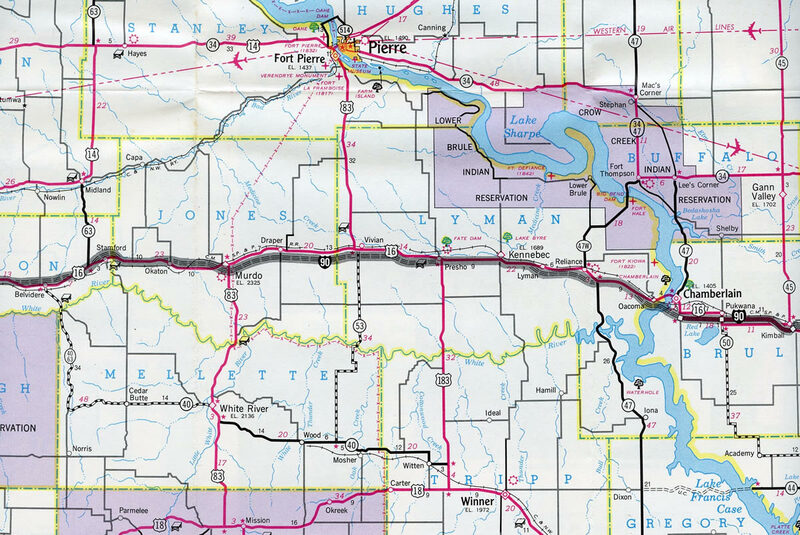 From Billings southeast to Buffalo, Wyoming, I-90 parallels U.S. 87, then follows U.S. 14 from Buffalo east to Wall, South Dakota. At Wall, I-90 replaced U.S. 16 east all the way to Tomah, Wisconsin. From Tomah southeast to Chicago, Interstate 90 more or less follows U.S. 14 again, but it picks up U.S. 20 at Rockford. I-90 and U.S. 20 remain parallel to each other from Chicago east to Boston, with some proximity to U.S. 6 in Ohio. Work on the three phase project commenced in spring 2009 on Phase I, Hyak to Keechelus. Wrapping up in fall 2018, this work involved adding a new lane per direction, bridge and culvert replacement, pavement replacement and improving sharp curves. Phase II ran between summer 2015 and fall 2018, affecting a two mile stretch from Keechelus Dam to the Stampede Pass interchange. Future work on Phase III, scheduled for construction between Summer 2001 and Fall 2025, improves the easternmost six miles of the project area with widening, pavement replacement and truck climbing lanes. Phase IV follows from Summer 2026 to Fall 2029. It adds an additional lane per direction, replaces the concrete pavement, adds wildlife crossings and a chain-up area, and straightens portions of the roadway. 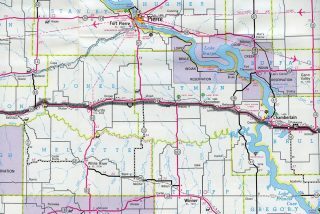 Several modifications were made to Interstate 90 from Rapid City east to Box Elder. Road work finished in 2009 realigned a portion of the freeway near Blackhawk, consolidating a split interchange with Sturgis Road (old U.S. 14 & SD 79) and removing an S-curve along the mainline. Further southeast, the tri-level stack interchange between I-90 and I-190 was redesigned into a trumpet interchange, removing left-hand ramps along westbound. Additionally the trumpet provides enough separation from the adjacent SPUI at Haines Avenue (Exit 58). Further east at Exit 60, the wye interchange from I-90 west to U.S. 16 west was eliminated and replaced with a new SPUI at Business Loop I-90 (East North Street). A third area SPUI was built in place of the diamond interchange (Exit 61) at the next eastbound exit with U.S. 16 Truck and South Dakota 79 south as well. The Chicago Skyway, a toll facility operated by the City of Chicago, carries Interstate 90 over industrial areas and the South Side of Chicago. The elevated toll road connect with the Dan Ryan Expressway (Interstate 94) south of Downtown. Photo taken 09/02/05. 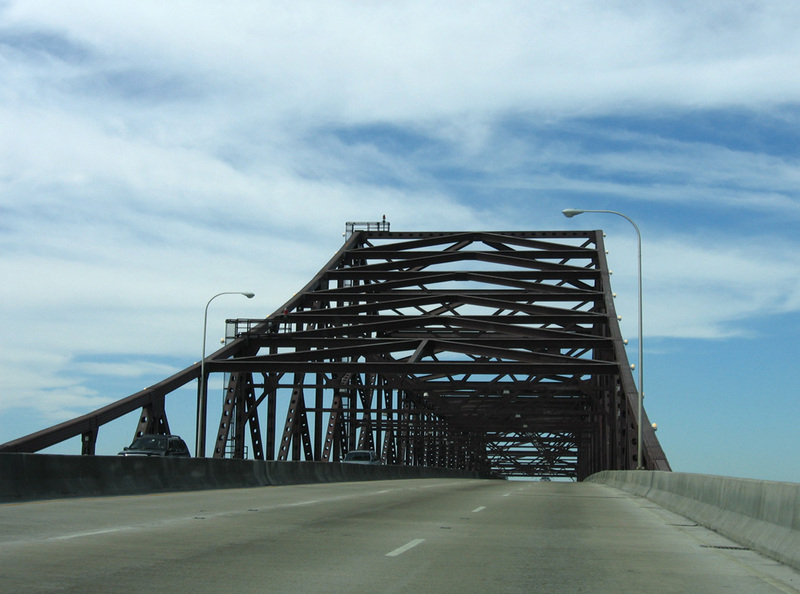 The Chicago Skyway is a steel cantilever bridge that connects the Dan Ryan Expressway (I-94) with the Indiana Toll Road (Interstate 90) in Illinois. Dominating the southeastern skyline of Chicago, the 7.8-mile Skyway was constructed in the 1950s and opened in April 1958 to cross over steel mills, railroads, homes and the Calumet River. The bridge did not carry as much traffic as initially anticipated, but the growth of casinos in Northwestern Indiana increased traffic counts. In 1999, city of Chicago administrators determined that the Chicago Skyway was never officially incorporated into the Interstate Highway System.6 This may have been due to the fact that the Skyway was not up to current Interstate standards. As a result of this determination, all Interstate 90 reassurance shields have an additional “TO” banner affixed above them. The elevated roadway underwent a reconstruction project between 1999 and November 2004.5 Prior to the completion of this project, the road was falling apart. With completion of the new Skyway deck, ramps, and three continuous, through lanes of travel, it is possible that the Skyway is closer to meeting Interstate standards. Of course, the Chicago Skyway is one of many Interstate Highways that are not up to the latest Interstate standards (see most of Interstate 278 in New York, for instance). As a result of this finding, one could claim that Interstate 90 has a gap, but to the average driver, it is not noticeable. Following reconstruction of the Chicago Skyway, the Chicago City Council voted to lease the bridge to a private company, the Skyway Concession Company, LLC (SCC), for 99 years. The agreement started in January 2005, infusing the city of Chicago with $1.83 billion from SCC. In exchange, SCC collects toll proceeds and provides for administration, toll collection, maintenance, and operations of the Skyway. The City of Chicago, meanwhile, continues to provide police to patrol the freeway. This arrangement was the first of its kind in the country. Through Indiana, Interstate 90 follows the Indiana Toll Road in its entirety. Authorized for construction in 1951, the Toll Road was constructed and fully open to traffic by 1956, the same year in which the Interstate Highway System was authorized by the federal government. The Toll Road was later added to the Interstate Highway System after it was completed. In 2006, the state of Indiana approved leasing and privatizing the Indiana Toll Road. A bid for this lease came in at $3.85 billion by the same Spanish-Australian consortium that leased the Chicago Skyway from the city of Chicago. The project was awarded to ITR Concession Company LLC (ITRCC) for a term of 75 years. Governor Mitch Daniels negotiated the lease, and the state House of Representatives approved the lease on February 1, 2006. The Senate approved the lease as part of the governor’s “Major Moves” program. By the middle of March 2006, Major Moves was law. ITRCC assumed operations on June 29, 2006. Funds generated by this lease were used for various transportation projects around the state12,13,14, including construction of new Interstate 69 between Evansville and Bloomington. The 1959-opened Innerbelt Freeway viaduct carrying Interstate 90 from Downtown to Tremont in Cleveland as seen from Jacobs Field (now Progressive Field), home of the MLB Cleveland Indians. This span was fully demolished on July 12, 2014. Photo taken by Jim Teresco (08/01). Throughout Montana, Interstate 90 directly overlaid or paralleled U.S. 10 closely. Portions of the freeway were open by 1968, including a lengthy stretch from Opportunity east through Butte to Cardwell. U.S. 10 remained signed between Missoula and West Fargo until 1987. Interstate 90 combines with U.S. 14 & South Dakota 79 through Rapid City. Photo taken by Joseph Barnes (12/13/17). The Inner Belt Project replaced the 1959-opened Innerbelt Bridge across the Cuyahoga River and rebuilds I-90 from I-71 (Medina Freeway) north to I-77 (Willow Freeway). Named the George V. Voinovich Bridge, the new westbound bridge was built between May 2011 and November 2013 at a cost of $293 million. The $273 million project to replace the eastbound span was awarded to TGR and designer URS Corporation in the fall of 2013. Construction culiminated on September 24, 2016, when eastbound traffic shifted to the second span. Subsequent work opened all five westbound lanes for I-90 across the George V. Voinovich Bridge by mid October and the remaining eastbound laens on October 24, 2016. Work on the weekend of October 28, 2016 restriped I-77 north at I-490 to three through lanes and the ramp from I-77 north to I-490 east to a single lane.29 For more on this project, visit the Innerbelt Project (ODOT Official Site). As part of the $24.3-billion “Big Dig” project in Boston, the Massachusetts Turnpike Extension lengthened Interstate 90 east 3.5 miles from the 1965 terminus at I-93 to Logan International Airport (BOS). Fully opened on January 18, 2003, the extension of I-90 shifted the terminus northeast to Massachusetts 1A in East Boston. West of the Ted Williams Tunnel and Seaport District is the Fort Point Channel Tunnel. The one mile long tunnel takes I-90 below Fort Point Channel between Interstate 93 (Central Artery and the Thomas P. O’Neill, Jr. Tunnel) and D Street by the Massachusetts Convention Center. The Fort Point Channel Tunnel opened to complete I-90 on January 18, 2003. The final traffic light for Interstate 90 was located in Downtown Wallace along old U.S. 10 (Bank Street) at 7th Street. 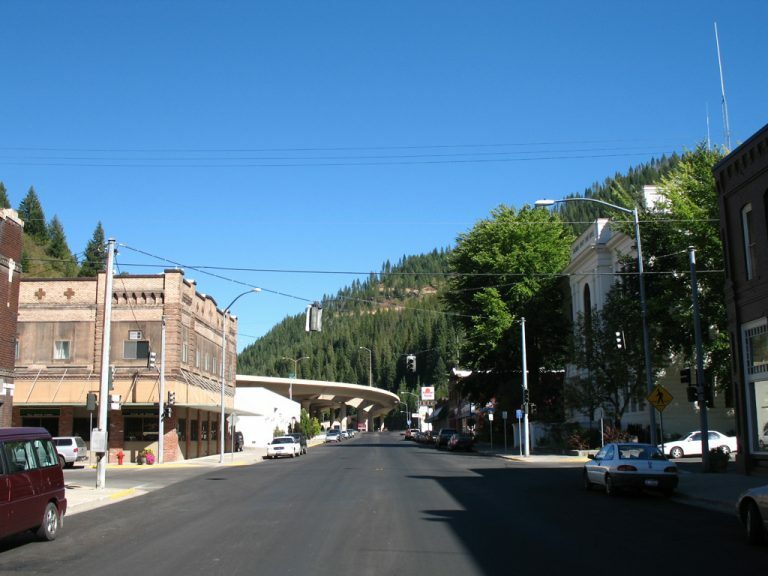 The former at-grade route of I-90 through Wallace is now Business Loop I-90. Photo taken 09/01/06. For a history of the completion of Interstate 90 in Wyoming, visit Interstate 90 @ AARoads. 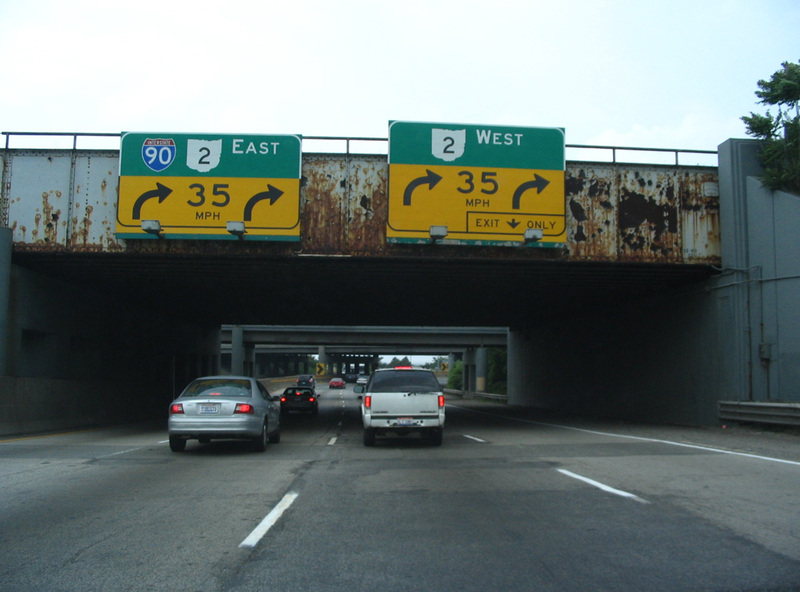 In Illinois, the sections of Interstate 90 were built in the 1950s and 1960s. The Northwest Tollway, which brings Interstate 90 southeast from Wisconsin to Rockford, Elgin and Chicago near O’Hare International Airport was constructed starting in 1956 and was completed by 1958.15 The construction of the 76-mile Northwest Tollway (and the other original tollways) was funded by a bond issuance in the amount of $415 million by the state tollway commission (which was created in 1953).18 The Northwest Tollway merges into the Kennedy Expressway near O’Hare International Airport (ORD). From the 1960s until 1978, Interstate 90 followed the Eisenhower (Congress) Expressway and Eisenhower Extension rather than the Kennedy Expressway and Northwest Tollway. For more on this historic route, visit Interstate 290 Illinois. 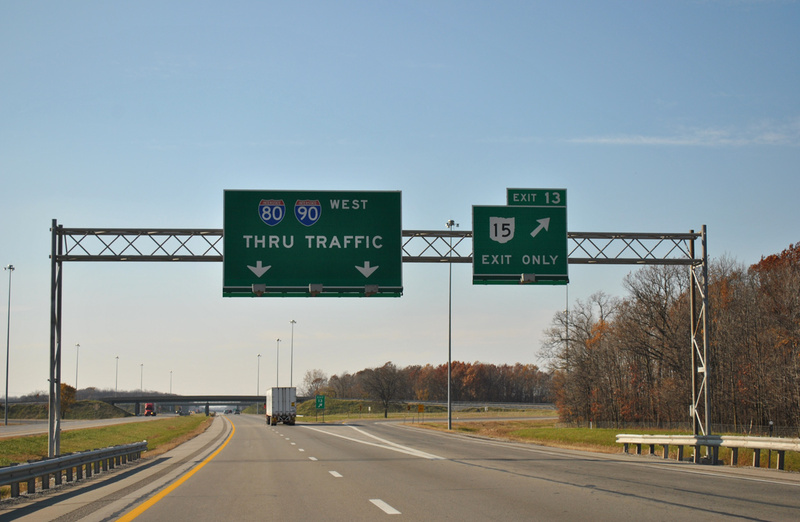 Interstate 90 follows the Ohio Turnpike from the Indiana Toll Road east to near the Cleveland metropolitan area. The act that created the Ohio Turnpike Commission was passed in 1949, and construction began on the Turnpike in October 1952. The 241-mile freeway was built in 38 months, with the route fully opened on October 1, 1955. For more information, visit the official Ohio Turnpike History page. 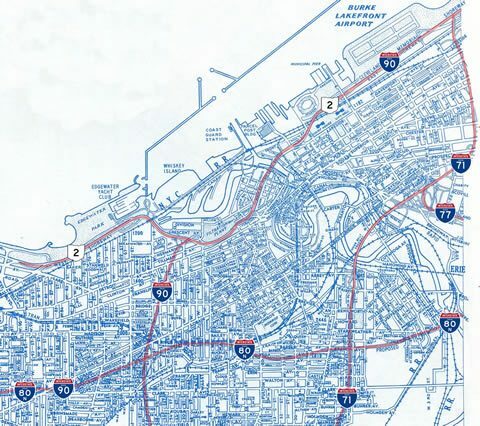 The Innerbelt was proposed to carry I-71 north to the Shoreway, with some maps showing I-71 & 77 overlapped north to the Shoreway. 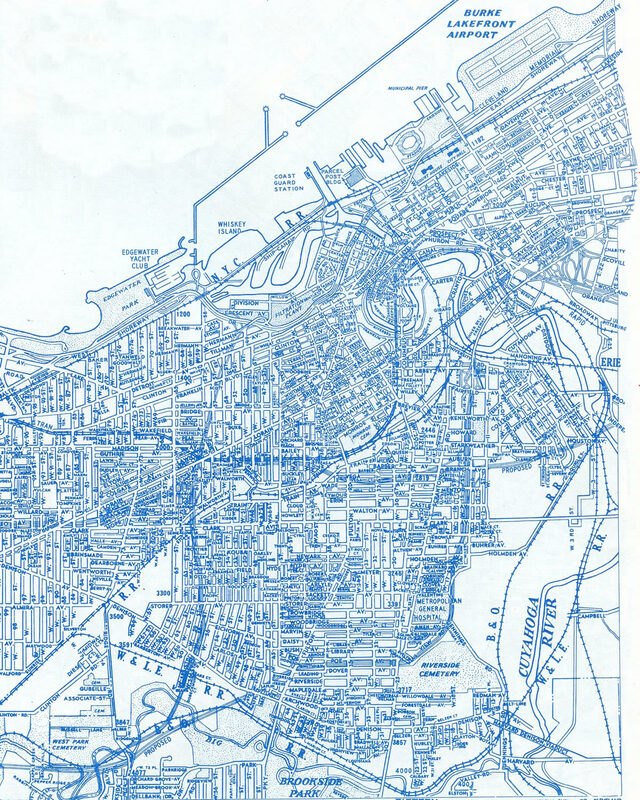 1950s Cleveland Freeway plans outlined a number of routes crisscrossing the city. Several of these were never built, including the Clark, Lee, Parma and Shaker Heights Freeways among others. Interstate 90 was routed along the Northwest Freeway east through Westlake, Rocky River and Lakewood into western reaches of the city. The route was to turn north at 65th Street onto the Parma Freeway to connect with Cleveland Memorial Shoreway (Ohio 2) at 49th Street. The Shoreway was then to continue I-90 east by Downtown to the north end of the Innerbelt Freeway. The remainder of the Northwest Freeway east to the Medina Freeway (I-71) and Innerbelt Freeway would have been a part of Interstate 80N. I-80N was proposed east along the Clark Freeway and south on the Bedford Freeway to Garfield Heights and the Outer Belt South Freeway (I-480). 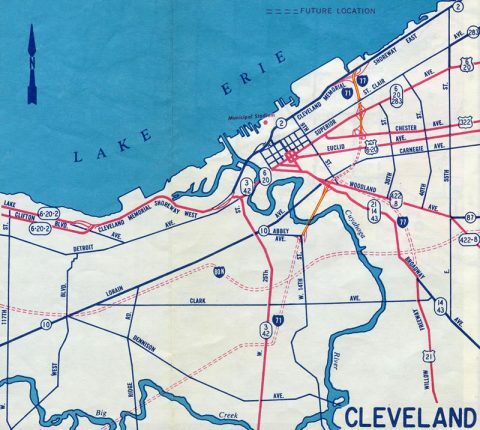 Commercial Survey Co. Street Guide, circa 1960, showing the proposed Parma Freeway extending north from the Northwest Freeway to Cleveland Memorial Shoreway. I-80N was later relocated onto the Outer Belt South Freeway, leaving the Clark Freeway as I-290 and later Interstate 490. 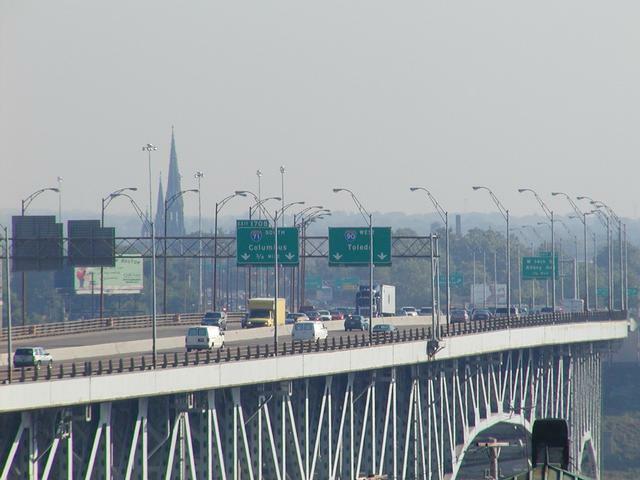 The Parma Freeway was dropped by the mid 60s, leaving I-90 along the Innerbelt alone. A wide median at 65th Street along I-90 (Northwest Freeway) alludes to a potential interchange with the Parma Freeway, while the 49th Street interchange on Ohio 2 would have been incorporated into the I-90 mainline. East of Downtown Cleveland and ahead of the south shore of Lake Erie, I-90 traverses the locally known Dead Man’s Curve. The freeway drops to 35 miles per hour as it abruptly turns from north to northeast and merges with Ohio 2 (Cleveland Memorial Shoreway). This curve is among the most substandard segments of Interstate 90. Interstate 90 at Dead Man’s Curve and Ohio 2, east of Downtown Cleveland. Photo taken by Steve Hanudel (06/18/06). The remaining section of Interstate 90 in New York, between Albany and the Berkshire Spur of the Thruway, is maintained by the New York State Department of Transportation. It was completed in the mid-1970s as the new alignment of I-90. Prior to that, the Berkshire Spur doubled as I-90. The 6.5-mile section of the Spur west from I-90 is unnumbered. 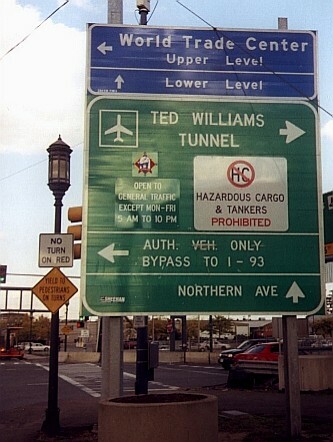 The Ted Williams Tunnel opened to limited operation prior to completion of Interstate 90 (Mass Pike) west across Fort Point Channel and north through Boston Logan International Airport (BOS) to Route 1A (East Boston Expressway). Photos taken by Dan Moraseski. Eastbound Interstate 90 emerges from the Tip O’Neill (Fort Point) Tunnel below grade at the Seaport District. 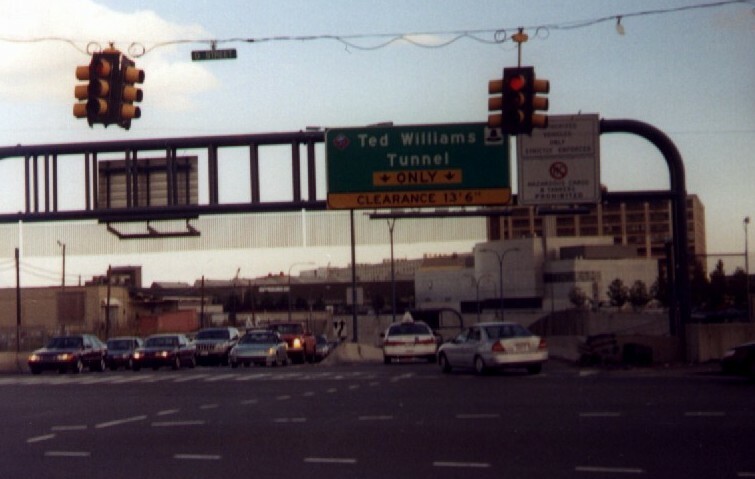 The toll road proceeds northeast through the Ted Williams tunnel to Boston Logan International Airport (BOS). Photo taken 07/28/07. Passing below Boston Harbor, I-90 curves northward through the 1.6-mile long Ted Williams Tunnel. Photo taken 07/28/07. Exit 26 partitions from within Ted Williams Tunnel for the passenger terminals of Logan Airport (BOS). Prior to completion of the ramps with Route 1A, I-90 temporarily ended along surface roads through the airport area. Photo taken 06/27/05. Interstate 90 east defaults onto Route 1A (William F. McClellan Highway) northbound just ahead of its exit for Route 145 (Bennington Street). Photo taken 07/28/07. A left side entrance ramp merges onto I-90 east from Logan Airport (BOS) at the two-wye interchange with Route 1A (East Boston Expressway). Route 1A enters East Boston from the Callahan Tunnel and Downtown. The limited access portion of the state route extends just north of I-90 to Route 145 and Addison Street. Photo taken 07/28/07. Flyovers connect Interstate 90 with the inside lanes of Route 1A (East Boston Expressway) beyond the end sign. Photo taken 07/28/07. Route 1A (William F. McClellan Highway) northbound splits with the ramp for Route 145 (Bennington Street) just north of the Interstate 90 eastern terminus. Route 145 loops east to Winthrop before turning back toward Route 1A in the city of Revere. Route 1A extends northeast from Revere to Lynn and Salem. Photo taken 06/27/05. Route 1A elevates onto a viaduct (East Boston Expressway) at the ramp for Saratoga Street and Route 145 (Bennington Street). The expressway advances 0.75 miles south to Interstate 90 west at Boston Logan International Airport (BOS). Photo taken 06/27/05. The Downtowns Boston skyline appears to the south on the Route 1A approach to Interstate 90 and Logan Airport (BOS). Route 1A travels through East Boston to the Sumner Tunnel and I-93 north at Downtown. The Massachusetts Turnpike begins from the left as I-90 arcs southward through the airport and Ted Williams Tunnel. Photo taken 06/27/05. Entering the two-wye interchange with Interstate 90 (Mass Pike) west and Logan Airport (BOS) on Route 1A (East Boston Expressway) southbound. Interests to the Boston Government Center are directed south via Route 1A to New Chardon Street in Downtown. Photo taken 06/27/05. As Interstate 90 westbound begins from Route 1A south, traffic partitions to a distributor roadway for Transportation Way and Airport Road to the passenger terminal of Boston Logan International Airport (BOS). Photo taken 06/27/05. The first confirming marker for Interstate 90 west appears at the entrance to Ted Williams Tunnel. The 1.6-mile long tunnel crosses Boston Harbor to South Boston. Photo taken 06/27/05. Prior to completion of the Fort Point and Ted Williams Tunnels and the eastern extension of the Mass Pike to Boston Logan International Airport (BOS), I-90 concluded at Interstate 93 by South Boston. Photo taken by Dan Moraseski (10/00). Exit 24 departed from I-90 (Mass Pike) east for Kneeland Street and Atlantic Avenue ahead of the ramps for I-93. The remainder of I-90 separated into ramps for I-93 & Route 3A (John F. Fitzgerald Expressway). Photo taken by Dan Moraseski (10/00). State named shield for I-93 on the button copy overhead for the northbound ramp to Downtown Boston and Logan Airport via Route 1A and the Callahan Tunnel. Photo taken by Dan Moraseski (10/00). Older guide signs at the I-90 east end. 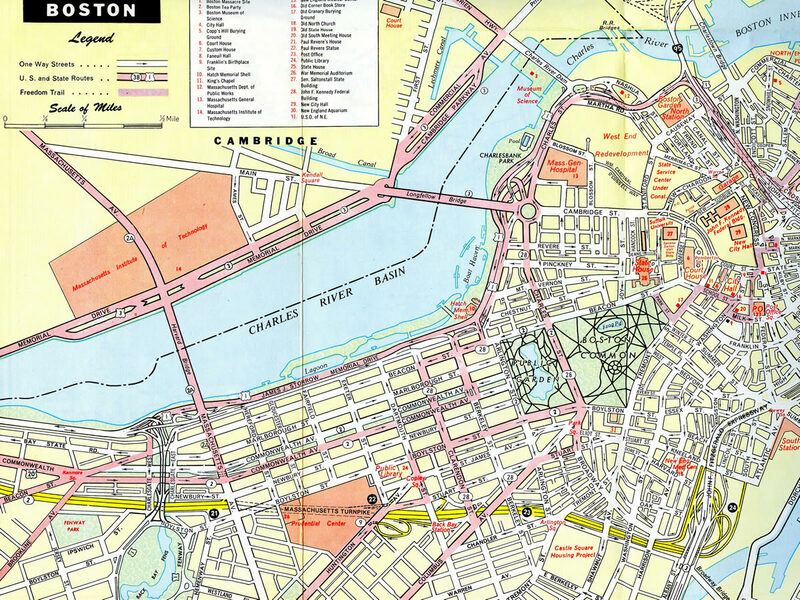 Prior to the Big Dig, Interstate 93 followed the elevated John F. Fitzgerald Expressway along a winding course northward through Downtown Boston. Photo taken by Dan Moraseski (10/00). Traffic split for the adjacent northbound lanes of I-93 north to Downtown and a sweeping ramp for I-93 south to Quincy below the Fitzgerald Expressway off-ramp to Kneeland Street. Photo taken by Dan Moraseski (10/00). State named shield at the gore point between the I-93 ramps. Photo taken by Dan Moraseski (10/00). I-93, U.S. 1 & Massachusetts 3 overlap north from Quincy to Downtown Boston. 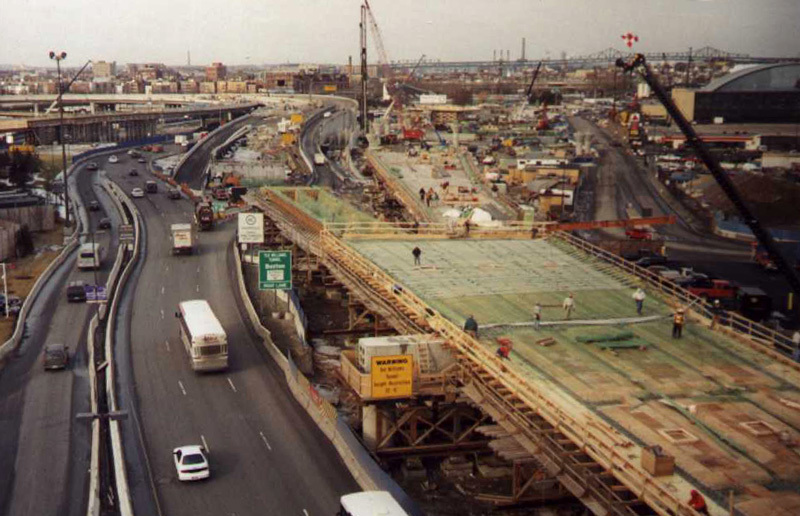 This view looks at the approach to I-90 during construction of the Big Dig. Photo taken by Douglas Kerr (09/01). Exit 20 overhead for I-90 (Mass Pike) on I-93 & Route 3 southbound. The connection from the Fitzgerald Expressway to I-90 linked with an adjacent on-ramp from Kneeland Street and off-ramp to Albany Street. Photo taken by Dan Moraseski (10/00). Guide sign for the Kneeland Street on-ramp to I-93 & Route 3A (Fitzgerald Expressway) south and Interstate 90 (Massachusetts Turnpike) west at Chinatown, Boston. Photo taken by Dan Moraseski (10/00). 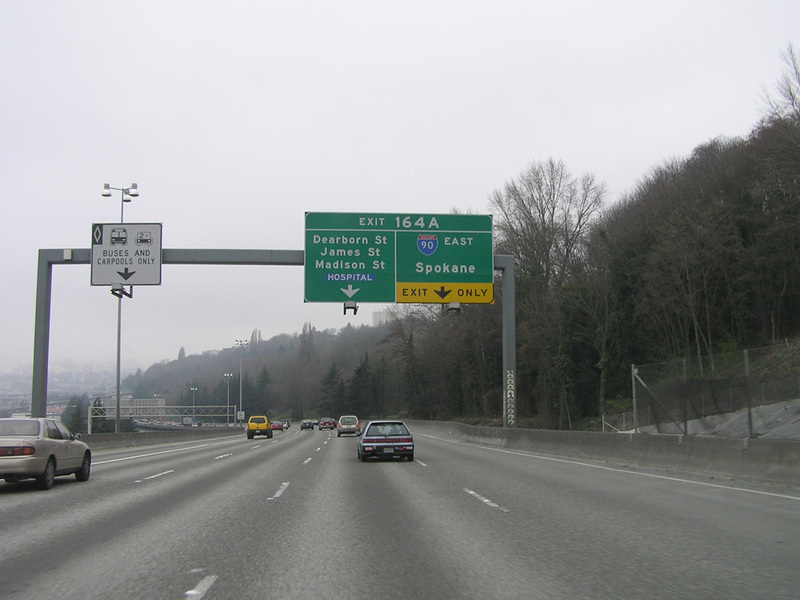 Exit 3B departs Interstate 90 westbound for Ranier Avenue (former SR 900) in the Mt. Baker section of Seattle. 1.4 miles of the freeway remains, with the subsequent exits connecting with Interstate 5 at a systems interchange. Photo taken by Chris Elbert (02/26/05). Advancing west with four lanes, Interstate 90 partitions into succeeding ramps for I-5 south (Exit 2B) to Tacoma, Olympia and Portland, Oregon and I-5 north (Exit 2A) to Everett, Mt. Vernon, Bellingham and Vancouver, British Columbia. Photo taken by Chris Elbert (02/26/05). Reaching Exit 2B, I-5 north to Everett and Vancouver, B.C., westbound Interstate 90 transitions into a double decked freeway configuration ahead of the left exit for I-5 south. Photo taken by Chris Elbert (02/26/05). Continuing west from I-5, the westbound lanes of Interstate 90 travel below the eastbound lanes to the ramp split for Edgar Martinez Drive South to Safeco Field and 4th Avenue South to CenturyLink Field, the Washington State Ferries and AMTRAK. Photo taken by Chris Elbert (02/26/05). Interstate 90 west emerges from the double-decked viaduct ahead of Safeco Field, home of the Seattle Mariners MLB franchise. 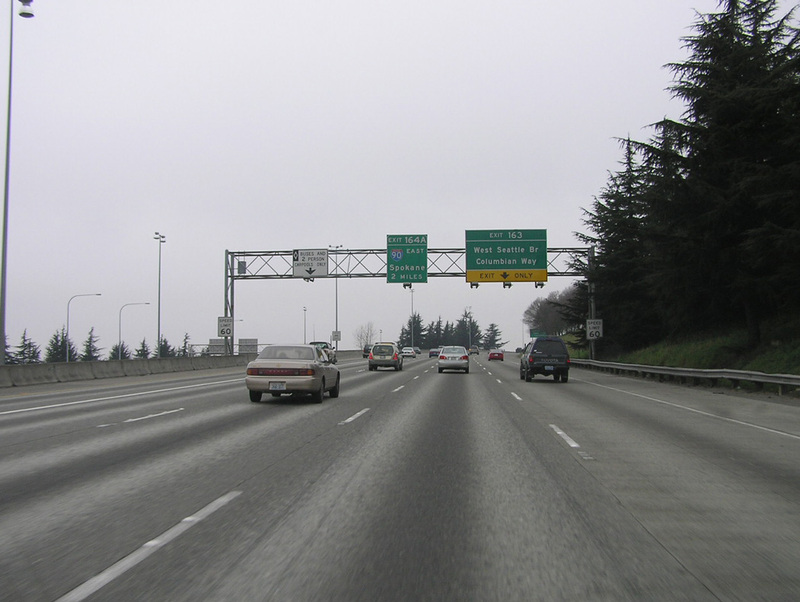 Eastbound I-90 begins along the flyover from Edgar Martinez Drive and 4th Avenue South. Photo taken by Chris Elbert (02/26/05). Washington 519 extends from east end of I-90 along a hook shaped alignment 1.14 miles along 4th Avneue South, Royal Brougham Way west and Alaskan Way to the Washington State Ferries. Photo taken by Chris Elbert (02/26/05). 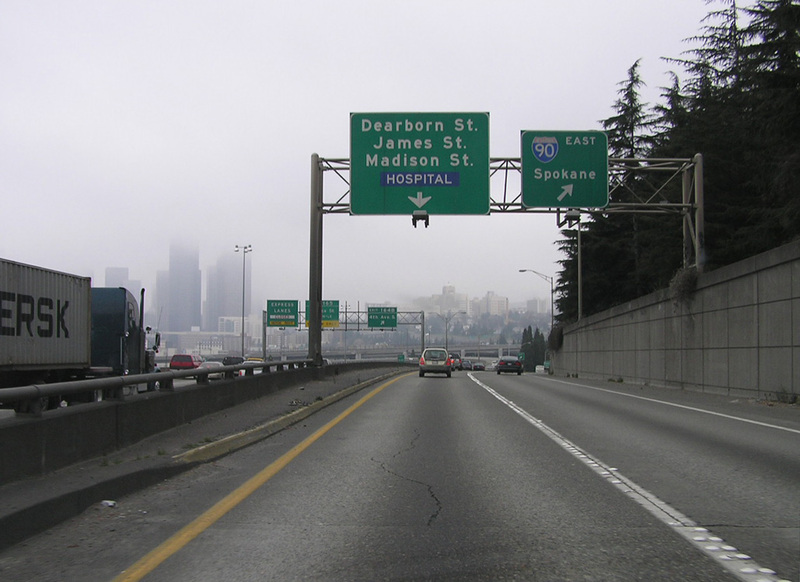 Interstate 90 westbound concludes with two-lanes connecting to 4th Avenue S northbound to the Seattle central business district and two lanes for SR 519 north to the adjacent stadiums and the Seattle Ferry Terminal. Photo taken by Chris Elbert (02/26/05). Edgar Martinez Drive South runs along the south side of Safeco Field between Dave Niehaus Way and ramps with 4th Avenue South and Interstate 90 east. Edgar Martinez played his entire career for the Seattle Mariners from 1987 to 2004. Photo taken 06/26/15. Flyovers from I-90 west and to I-90 east tie into Edgar Martinez at the elevated intersection with the ramps from 4th Avenue South. Photo taken 06/26/15. A pair of confirming markers appear at the eastbound beginning of Interstate 90 from 4th Avenue South and Edgar Martinez Drive S. The flyover curves northward over the King County Metro Ryerson Base bus yard to the double decked section through the systems interchange (Exits 2A/B) with Interstate 5. Greenouts here covered Everett for I-5 north and Tacoma for I-5 south. Photo taken 06/26/15. Interstate 90 eastbound ascends onto the top deck of the multi-level exchange with Interstate 5. Departing next is Exit 2A for I-5 south to Tacoma, Olympia and Portland, Oregon. Photo taken by Chris Elbert (02/26/05). 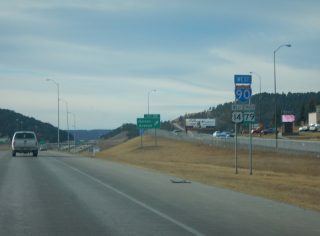 A left exit connects I-90 east with Interstate 5 north to Everett, Mt. Vernon, Bellingham and Vancouver, British Columbia. Photo taken by Chris Elbert (02/26/05). The second confirming marker for I-90 east precedes the 12th Avenue over crossing at the North Beacon Hill community. Completed in June 1989, the initial seven miles of Interstate 90 between areas south of Downtown Seattle and Bellevue included upgrades to the Mount Baker Ridge Tunnel and the Lacey V. Murrow Memorial (Lake Washington Floating) Bridge. The Mount Baker Ridge Tunnel is the world’s largest diameter soft earth tunnel. Photo taken by Chris Elbert (02/26/05). 4th Avenue S southbound crosses a viaduct over the Amtrak lines and lowers to street level ahead of the west end of Interstate 90. Trailblazers for I-5/90 direct motorists southward along 4th Avenue S to Royal Brougham Way and the ramp to Edgar Martinez Drive S. SR 519 begins at the ensuing traffic light. Photo taken by Chris Elbert (02/26/05). 4th Avenue South (SR 519) intersects Royal Brougham Way below the westbound flyover. The ensuing ramp connects with Edgar Martinez Drive South at Safeco Field and Interstate 90 eastbound. Redevelopment of this area for the Seattle sports venues included traffic pattern changes and a new connection to I-90. Photo taken 08/29/06. SR 519 north turns west onto Royal Brougham Way to connect with the Seattle Ferry Terminal. The ramp from 4th Avenue S to I-90 east and Edgar Martinez Drive S follows. Photo taken by Chris Elbert (02/26/05). A modified single point interchange joins 4th Avenue South, Edgar Martinez Drive west and Interstate 90 east. Traffic ascends to an elevated intersection. Photo taken by Chris Elbert (02/26/05). Interstate 90 formerly began from an intersection with 4th Avenue South. This connection closed permenently with construction of Safeco Field, home of the Seattle Mariners MLB franchise. Photo taken by Jeff Royston (09/99). A begin shield was posted at the ramp to I-90 east from 4th Avenue South. The CenturyLink Field Event Center Parking garage rises just west of the old ramp configuration adjacent to several railroad lines. Photo taken by Jim Teresco (09/99). The previous first confirming marker for I-90 east stood along the connection from 4th Avenue South. Milepost 2 factored in Washington 519, linked the Puget Sound Ferry Docks at Elliott Bay with Interstate 90. Photo taken by Jim Teresco and Rob Foulis (06/27/01). Exit 164A connects Interstate 5 north with I-90 east and 10th Avenue South at Dearborn Street. The two freeways meet at a four-level interchange between the International District and North Beacon Hill in Seattle, Washington. Photos taken by Chris Elbert (02/26/05). Mileage update provided by Gary S. Peterson. “Exit 66 now road to nowhere.” The Rapid City Journal, October 2, 2003. “It’s Red Lights Out In Idaho Town.” Chicago Tribune, September 15, 1991. Divided Highways: Building the Interstate Highways, Transforming American Life in 1997 by Tom Lewis, Viking Penguin/Penguin Books, page 199. “Lease sale closes on Indiana Toll Road for $5.72B” WLFI, May 28, 2015. “Toll Road plan clears senate: Chambers’ leaders say differences remain”. Indianapolis Star, by Theodore Kim, March 3, 2006. “Toll Road bill signed, Daniels moves quickly.” Indianapolis Star, by Theodore Kim, March 16, 2006. “A tale of 2 projects — and political implications.” Indianapolis Star, by John Ketzenberger, March 21, 2006. “Dead Man’s Curve could be worse – in fact, it was” Cleveland Plain Dealer, April 22, 2001. “Jane Addams Memorial Tollway – Newburg Road to Rockton Road – Reconstruct & Widen>” Illinois Tollway, press release, November 24, 2009. Ted Williams Tunnel (I-90), BostonRoads.com. Tunnels & Bridges – The Big Dig – Highway Division, massDOT. “Re: Massachusetts” online posting by PHLBOS, AARoads Forum, February 18, 2016. “I-90 now four lanes all across Montana.” The Spokesman-Review, May 14, 1987. “State’s big move to all-electronic tolling begins Friday as toll plazas shut down.” MassLive, October 24, 2016. &Inner Belt Bridge is completely open today.” The Plain Dealer (Cleveland, OH), October 24, 2016.